Porcelain veneers are an excellent cosmetic dental solution to improve the appearance, shape, colour and positioning of your teeth, with minimal preparation of the natural teeth required. They provide a quick and easy boost to your smile, focusing on the front teeth. Dental veneers are thin slivers of porcelain that are placed over the front surface of your teeth, similar in concept to false fingernails. Your dentist will carefully choose a shade of porcelain that matches the shade of your teeth, so the veneers look natural. They are held in position with a special bonding glue. 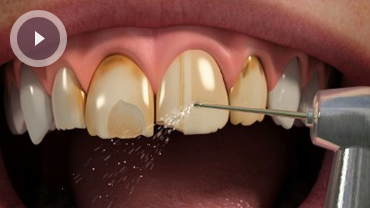 Veneers can be used to lighten the front teeth or to improve the appearance of a discoloured tooth. They can also be used to cover fluorosis (white marks on the teeth) and stains, can disguise slightly crooked or gappy teeth without the need for orthodontic treatment, and can make a chipped tooth look whole again. In the latter case, a thicker piece of porcelain is used to replace the chipped or broken part of your tooth. To prepare your teeth for veneers, a small amount of enamel is removed from the surface of the tooth to ensure the veneers can be properly bonded. Your veneer will be made to the exact thickness of the enamel that has been removed, so your teeth will remain the same size. This is done under local anaesthetic. When your teeth have been prepared, your dentist will take an impression of them and this, along with information on the shade of porcelain required and any other necessary information, is given to the technicians in our laboratory, who will then make up your veneers to order. You will be called back to the practice for a second appointment when your veneers are ready, so that we can fit them. With proper care your veneers should last you many years, although just like natural teeth they can get chipped or broken. Keeping up regular dental check-up appointments will help you to keep your veneers in the best condition.